I invite over a group of ladies, who are also encouraged to invite other ladies that might be interested. They are invited to bring over any clothing items, jewelry, accessories, bags or shoes that they no longer wear or want in their wardrobe. It doesn't matter what size or style. As long as the items are clean and in wearable condition, they are welcome. When everyone arrives, we dump out our belongings into piles throughout my home. 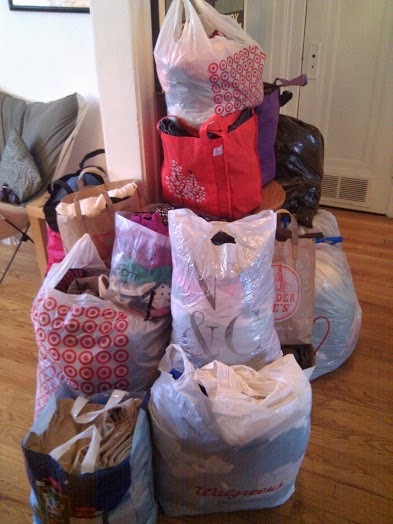 A pile for coats, a pile for pants, one for dresses and one for shoes....you get the picture. Then, it's a free-for-all! Everyone is invited to sift through the piles for whatever items they might like to take home with them. There are mirrors available for those trying on things. Whatever is left after everyone has taken what they want, goes into bags taken to charity. We all clear out some space in our closets, and we all take home some new pieces...all for free! So, today, I've got some time open in my schedule. Since there's a swap this weekend, I'm going to take some time to look through my closet. I'll pull out a couple things that I know I didn't wear this winter, because I probably wouldn't wear them next winter. There might be a handful of things I'm not sure of the fit anymore; I'll try those things on to make a decision. I'll look through my shoes, my winter accessories, etc. Chances are, I'll have a medium sized bag ready to go. Not only do I look forward to finding some great items my friends no longer wear, but I'm glad to help a local charity with our unneeded items. Just look how much we took in from one of our past swaps!